The Deformed 3x3 Centrosphere is an exotic-looking 3x3 shapemod in which each side has been carved out in the shape of a hollow circle and the corners have been elongated so as to form a 2x2 cage around the central sphere. 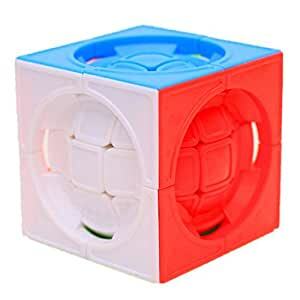 Decent cube but challenging to turn all sides, especially the center due to the corners. Solvable but punches skin with each turn and overall stiff.